Twitter has always been a powerhouse for any social media marketer. Influencers such as Tim Fargo, Jeff Bullas and Larry Kim use Twitter to reach out to thousands of social media followers — if not hundreds of thousand of them. Personally, Twitter is one of my most important and powerful arsenal I have ever used and until today, Twitter is the tool that makes my money from affiliate sales to custom paid services. Yes, I know the power of Twitter and with the right strategies, Twitter can bring you a lot of traffic and leads. But have you ever wondered, what are the “don’ts” in Twitter marketing? 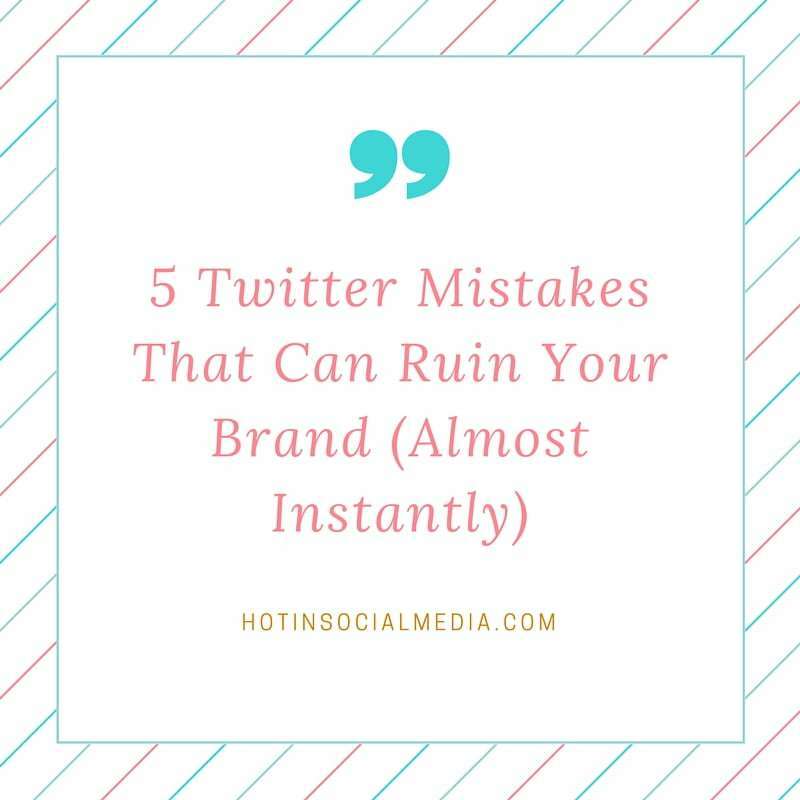 In this post, you will discover the top 5 Twitter mistakes I had done early in the past (as well as Twitter mistakes I’ve seen myself), which backfired back at me with no chance of rescue. Laugh it out loud if you want to but trust me, these Twitter mistakes could easily ruin your brand’s name faster than you can imagine. I come across this one too many times and if you need some convincing, login to your Twitter (yes, do it right now) and scroll down the Twitter feed. Most of you will not need more than three scrolls to see a tweet focusing on promoting products. Sure, it is not wrong to publish “buy my product please” type of tweets but there are both right and wrong ways to do it. The wrong way is when you do not offer anything to your followers or potential buyers when they click the link to check on the products. You are literally telling them to ‘read the tweet, click on the link and potentially consider buying my product’. If you have to promote a product on Twitter, do it by convincing them why they need to do so. I personally call this soft selling and you need to soft sell to your Twitter audience and not those hard / direct selling right at their doorsteps. When you publish too many of the self-promotional tweets, you are going to lose your current followers because they will be bored of your tweets (or considering it as spam). Have you ever seen a tweet or mention like the below? Seriously, I don’t understand why you need to beg for followers. Twitter has millions of followers and if you are not able to find one who will follow you willingly, you are in trouble. As a matter of fact, you need to instantly change your Twitter marketing strategy! Begging doesn’t make your Twitter profile attractive or adding trustworthiness level into the equation. It is plain annoying and you should stop it immediately (if you are doing it). Trust me, there are better things that you can do that ‘that’. No offense but if there is a chance, always go for a shorter length tweet. It is more attractive and interesting to read to say the very least. The tweet is short, meaningful and it comes with an awesome photo. Now, that’s what you need to aim for! Sure, Twitter allows you to write a lot in a tweet but it certainly doesn’t warrant you to completely utilize the entire quota of 140 characters. Instead, always aim to compose a tweet which is succinct, witty and straight to the point. Don’t worry — your Twitter followers are going to love it and you can thank me later! I am at fault at this and I am trying my best to resolve this too. How many times did you receive a mention and decide not to respond to it? There is a person behind a Twitter handle (that’s you) and followers would want to engage with the person directly — not just a Twitter handle or account. Do not neglect those who try to connect with you on Twitter and by now, you should understand the true power of Twitter as a customer service tool. In customer service, most challenges can be resolved without issue if the matter is attended within a short time period. Always consider that others would want to reach out to you because of a specific reason. If you are running a business, engage with your fans on Twitter and trust me, you will not only increase your sales but as well as increasing the satisfaction level of your customers. Call this a rant but it is true. Too many hashtags are going to kill your Twitter marketing strategy, regardless how good they are. What is the user trying to promote? It is the company doing wholesale or boutique? Or, is the company a wholesale distributor? If you are publishing a tweet, make sure that it is easy to understand and makes sense to your Twitter followers. There is no point trying to maximize the number of hashtags when it will affect the entire meaning of the tweet. The general rule of thumb in using the hashtag is not using over three hashtags in a tweet. If your plan is to reach out to a wider audience, always consider using several Twitter updates instead of cramping everything into one. You have read what ‘not’ to do in Twitter marketing. So, what are you going to do with the information? Will you be incorporating them into your overall Twitter marketing strategies? I am sure there are more Twitter mistakes but these are the top 5 most common (and annoying) mistakes I have seen or done on Twitter. What do you think? Have you done any of these mistakes in the past (and care to admit)? Leave a comment below and let’s share!